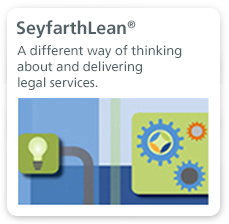 Seyfarth’s patent litigation team includes a multidisciplinary group of legal professionals with strong technical backgrounds in biology, biochemistry, organic chemistry, molecular biology, and pharmacology. Our team of experienced trial and appellate lawyers craft and execute comprehensive intellectual property strategies from initial drug development through trial and appeal. Our attorneys have represented some of the top innovator and generic drug companies in Hatch-Waxman litigation including AIA proceedings, district court trials and Federal Circuit appeals. Our fully integrated approach to Hatch-Waxman litigation includes pre-suit investigations and opinions of counsel, Paragraph IV Certification/Notice Letter preparation, ANDA filings, trial, settlement, and appeal. We have represented both First to File clients as well as joint Abbreviated New Drug Application (ANDA) filers through joint defense arrangements. Our legal team includes Ph.D.s that have expertise in organic chemistry, pharmacology, molecular biology; as a well as drug synthesis, formulation, and polymorphs. From our deep bench, we are able create legal teams including scientist-lawyers, transactional specialists, and experienced litigators, including those who served as law clerks at the Federal Circuit, which allows us to tailor our technology and legal strategy for each project and budget. Our lawyers are recognized experts in the Hatch-Waxman Paragraph IV field, and have been involved in some of the leading-edge Paragraph IV litigations. We have experience in all aspects of pharmaceutical regulation, from inception to end-of-product life cycle management, product selection, including intellectual property review, freedom to operate, non-infringement and invalidity opinions, regulatory affairs counseling, size/shape/color opinions, and litigation management. We counsel and provide strategy relating to NDA, 505(b)(2) “Paper NDA,” ANDA applications, regulatory strategy and assistance in moving applications through the system. For those clients interested in drug repositioning, we can assist in legal issues related to new indications, new exclusivities, development of intellectual property estates to protect the repositioned drug, development of regulatory strategies to minimize competition, and counseling on legal strategies to maximize returns. We assist or litigate exclusivity determinations relating to ANDA 180-day exclusivity decisions, NCE 5-year data exclusivity, NP/NDF 3-year exclusivity, and 7-year orphan drug exclusivity. We have represented pharmaceutical and medical device clients with respect to licensing agreements, manufacturing and supply contracts, fraud and abuse compliance, group purchasing agreements, medical director agreements, and compliance with marketing standards. We work with clients with respect to regulatory strategies in medical device approvals, from counseling on strategies of 510(k) and PMA submissions, to humanitarian use exceptions, product recalls, product liability lawsuit defense, and corporate transactions. The Biologics Price Competition and Innovation Act of 2009 (BPCIA) provides a legal framework for FDA approval of biosimilar and bio-interchangeable follow-on biologic products, as well as a paradigm for related patent litigation. Our team of biotechnology attorneys routinely performs landscape searches and freedom to operate analyses with respect to target biologics for some of the world’s top developers of Biosimilars. We understand both the value and potential threat represented not only by patents covering actual innovator biologics but also how to identify and handle the equally important patents related to biologic production, isolation, purification, storage, and administration. We also keep abreast of the rapidly evolving biosimilars legal landscape and frequently blog and speak at industry conferences on this topic and BPCIA strategies. Members of our team have been General Counsel of biotechnology companies. As such, we understand the relevance of patent matters and weigh them in light of actual business strategies and if necessary address them through biosimilars patent litigation. We offer complete support relating to pharmaceutical and biological drugs matters. For example, we also serve as appellate counsel to clients even when other law firms served as trial counsel. Recognizing that appeals in the Federal Courts usually terminate with the intermediate court of appeals, we work to ensure that a client’s victory is preserved on appeal or a negative verdict is overturned. Furthermore, we can assist clients in appeals to the U.S. Supreme Court either as counsel of record or as amicus counsel. Our firm also has significant experience in handling International Trade Commission (ITC) actions. Our practice also includes experience in Food and Drug Law involving pharmaceuticals and medical devices. Seyfarth’s Food and Drug Group represents clients whose businesses are regulated by the Food and Drug Administration (FDA) and the Federal Trade Commission (FTC). Our clients include companies that manufacture and distribute pharmaceuticals, bulk chemicals, vaccines, biologics, medical devices, and cosmetics, as well as food and dietary supplements. Our attorneys assist clients throughout the developmental, approval, production, and marketing stages of products to ensure that clients understand existing rules and regulations and the need to develop new strategies to address the regulatory environment. Our attorneys provide valuable counsel to FDA-regulated companies because we understand the regulatory and policy components of FDA as well as the relationship between FDA and Congress, and we know how to litigate matters concerning both the FDA and FTC. We further advise companies on the conduct of clinical studies on a national and international basis, on regulatory submissions and manufacturing as well as on FDA enforcement matters. Our attorneys have experience involving the labeling, marketing, and development of both pharmaceuticals and medical devices. 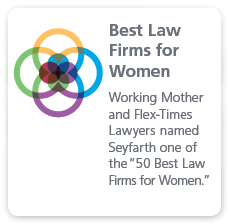 Seyfarth Shaw LLP represents a diverse roster of clients, from multi-national corporations to cutting-edge start-up companies. 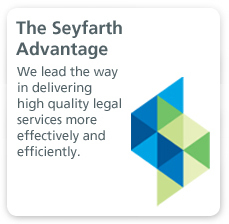 Whether we are acting as counselors or high-stakes litigators, Seyfarth is committed to obtaining our clients’ desired results promptly and efficiently. We constantly examine the strategy at each phase of the case until resolution. We also ensure that our cases and matters are staffed with the right team of lawyers and personnel, which offers clients both cost efficiency and a dedicated team backed by the strength and resources of one of the nation’s premier law firms. Practical and actionable insights into patent legal developments affecting the Life Sciences Industry. 3/6/2019 Biosimilar IPRs: Timing is Everything . . . But When is The Right Time?